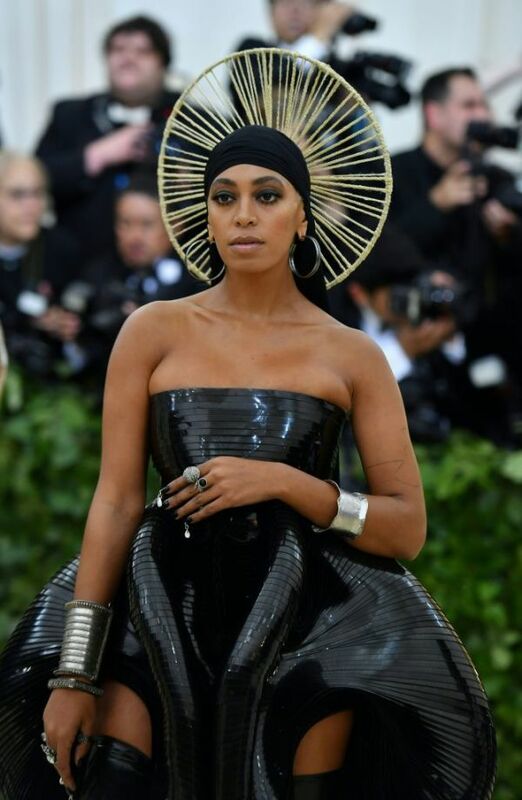 The Met Gala is fashion's biggest night and this year's theme was "Heavenly Bodies: Fashion and the Catholic Imagination." 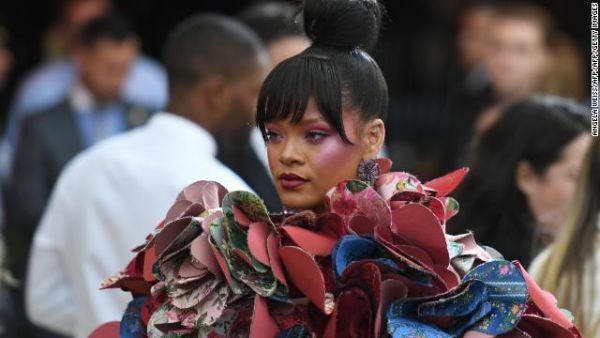 The gala, which is annually held on the first Monday in May, was hosted by Rihanna, Amal Clooney, Donatella Versace, Anna Wintour and Stephen and Christine Schwarzman. Given the theme, there was a lot of religious imagery, complete with headpieces and lots of crosses. Rihanna wore a papal crown and cape designed by Margiela. Katy Perry wore 6-foot angel wings. Rapper 2 Chainz popped the question to Kesha Ward, with whom he has three children. She said yes, though it was unclear if this was Epps' original proposal. Kim Kardashian walked the carpet solo without her husband Kanye West. This comes as a bit of a surprise to fans who have become accustomed to seeing the fashionable duo at the gala for the past several years. 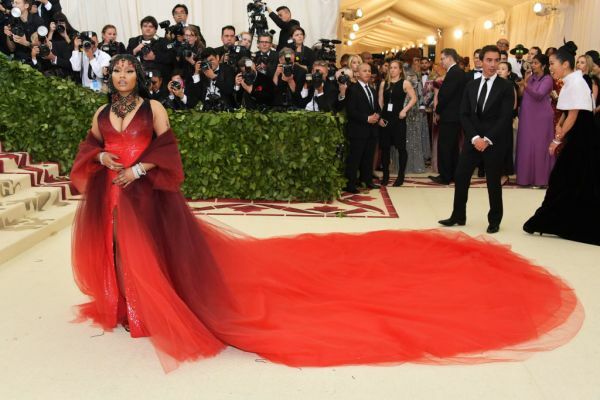 And finally, Cardi B wore a jeweled headpiece and plunging beaded gown at her first Met Gala red carpet. 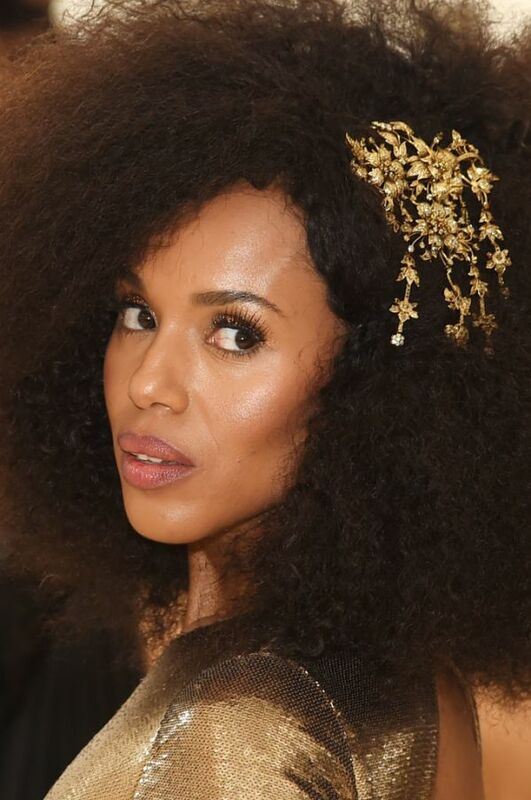 Whether it was a crown, veil or a Pope's hat, the clear winner tonight was the headpiece. 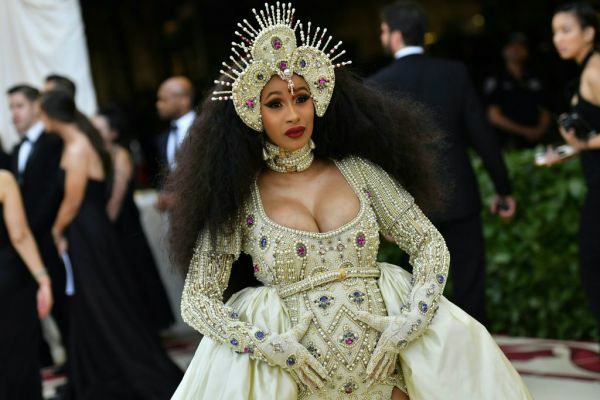 Celebrities, including Madonna, Solange Knowles and a very pregnant Cardi B, wore the accessory to top off their elaborate gowns. 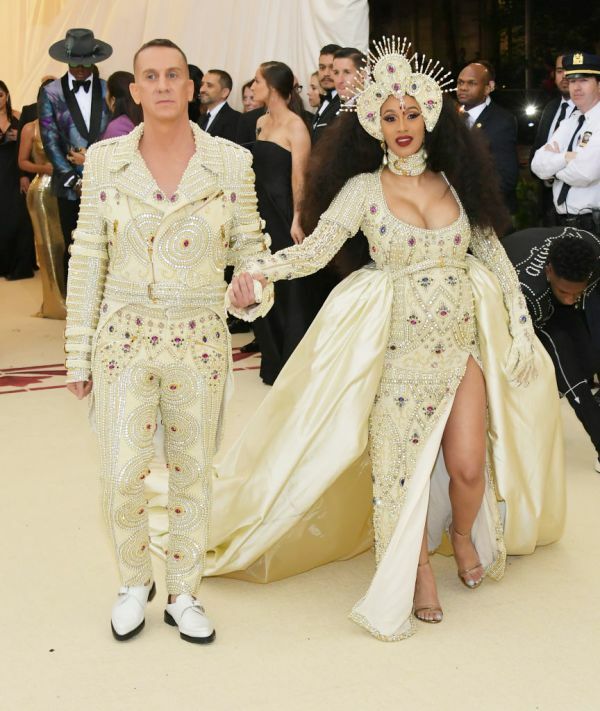 Cardi B rocked a headpiece and shimmering gown and train. She was joined by designer Jeremy Scott on the carpet tonight. 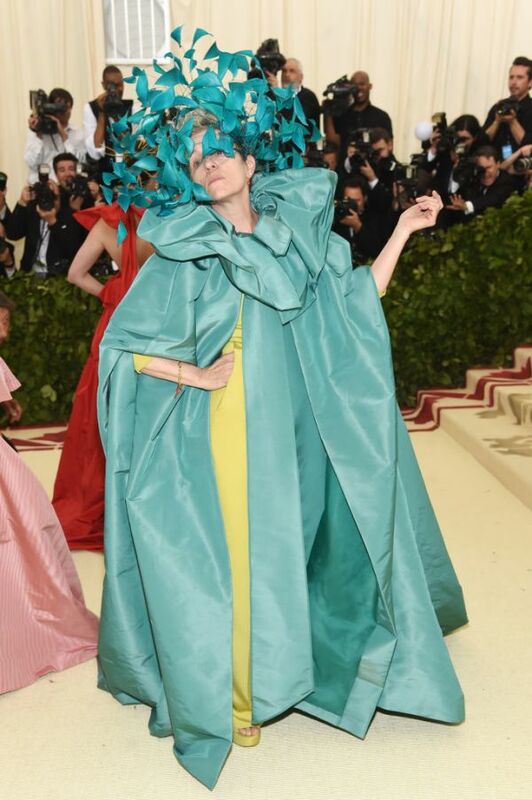 President Trump won't be receiving an invite to the Met Gala as long as Anna Wintour is running the show. 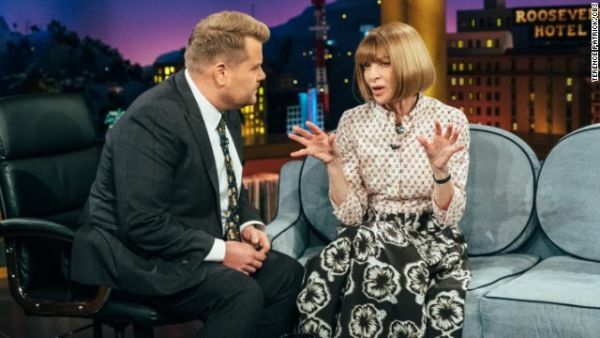 Wintour, Vogue's current editor, revealed that she would never invite Trump back to the gala while playing "Spill Your Guts or Fill Your Guts" on "The Late Late Show with James Corden" in October. 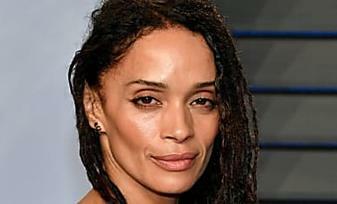 She had the option of dining on pickled pigs feet or naming the celebrity that would never again invite back to the gala. Wintour quickly spilled the beans, responding, "Donald Trump." 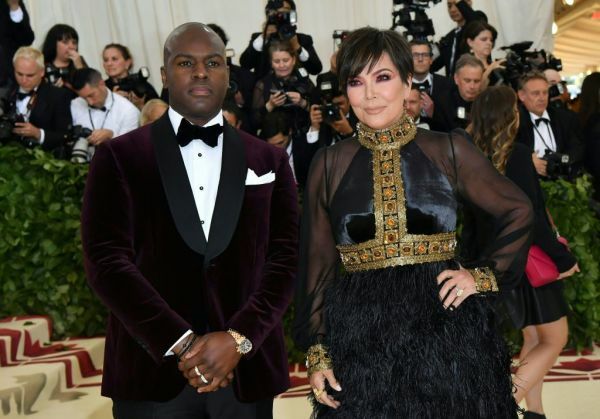 The Kardashians' matriarch, Kris Jenner, was also there. 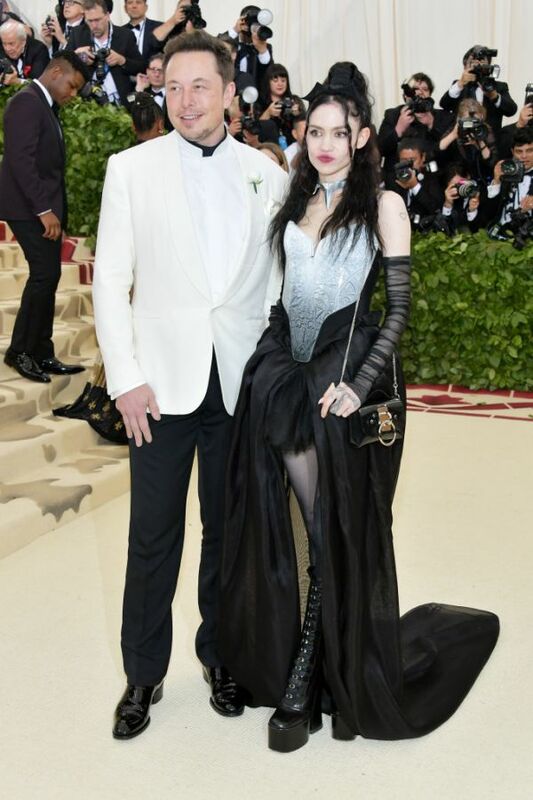 Tesla CEO Elon Musk and musician Grimes arrived together at this year's Met Gala. The New York Post reported earlier today that the two are dating. 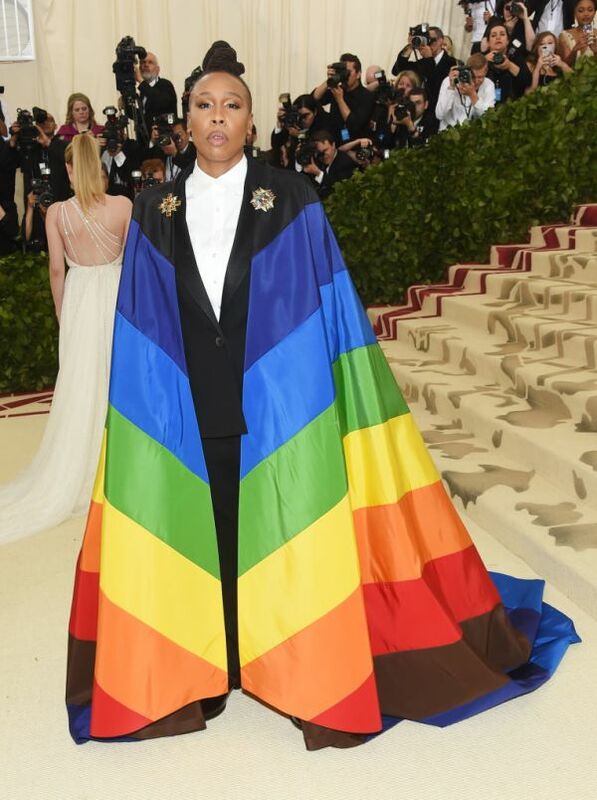 Emmy winner Lena Waithe wore a rainbow-colored cape tonight. Mindy Kaling: "Watch the queen conquer"
Model Chrissy Teigen usually attends the Met Gala. But this year, the very pregnant Teigen is at home. 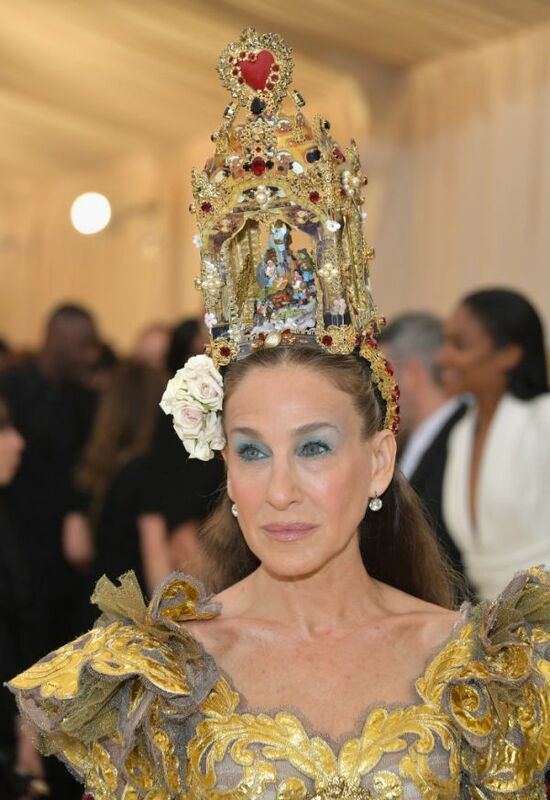 Sarah Jessica Parker just walked the carpet wearing an ornate headpiece that included figurines. 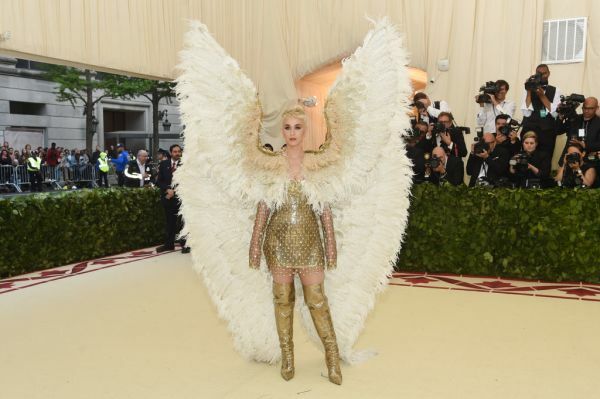 Pop star Katy Perry is wearing huge angel wings to the Met Gala tonight. 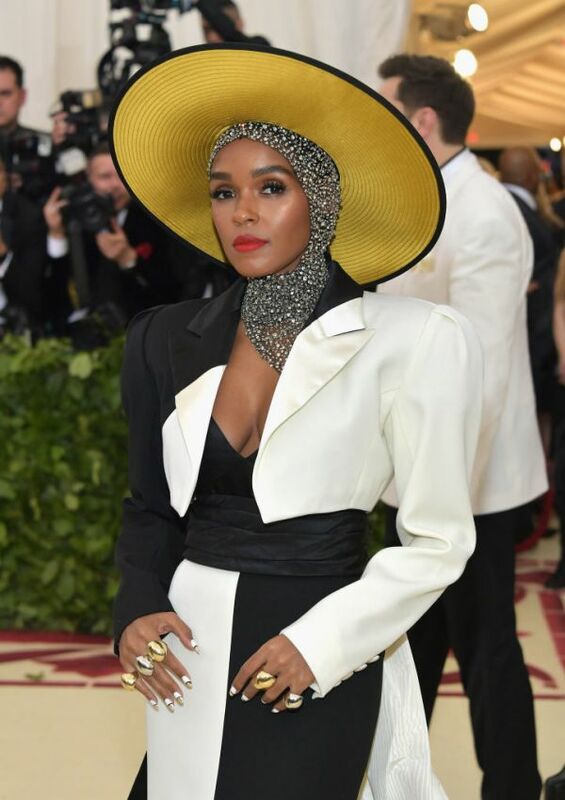 She and other stars donned elaborate accessories, including crowns, veils and a Pope's hat, to celebrate the gala's theme, "Heavenly Bodies: Fashion and the Catholic Imagination. 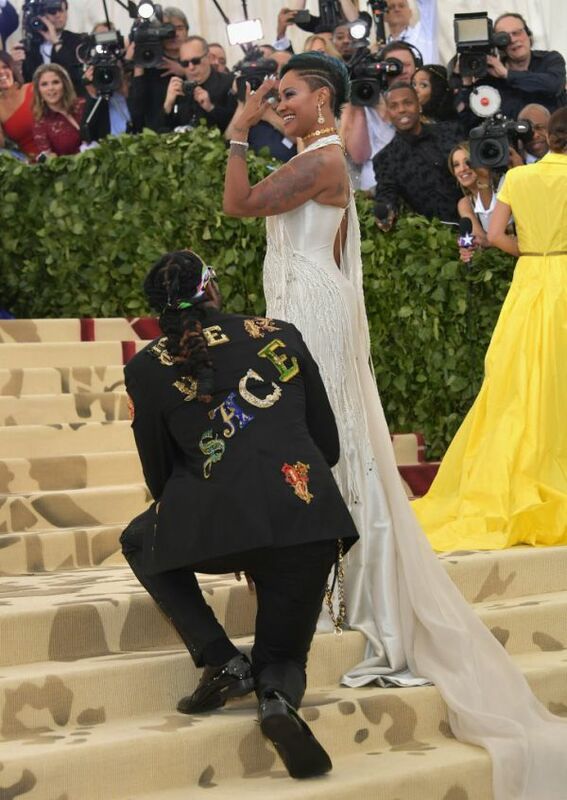 Rapper 2 Chainz, whose real name is Tauheed Epps, got down on one knee on the famous Met gala stairs and popped the question to Kesha Ward, with whom he has three children. She said yes, though it was unclear if this was Epps' original proposal. CNN has reached out to his representatives for comment. 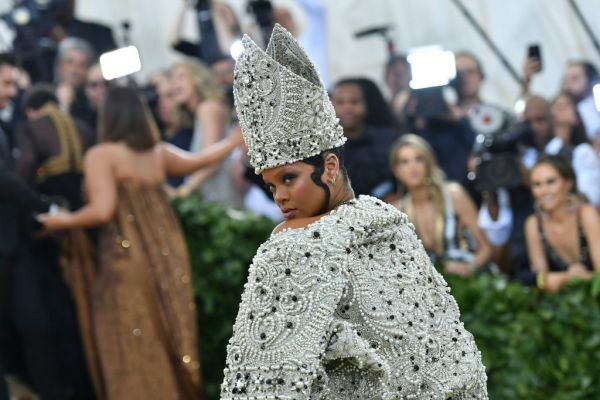 Rihanna just donned a mitre, a hat worn by the Pope, to the Met Gala tonight in honor of this year's theme, "Heavenly Bodies: Fashion and the Catholic Imagination." Rihanna is co-hosting the event with Anna Wintour, Donatella Versace and Amal Clooney. Model Gigi Hadid is excited about tonight's big event. She shared this photo yesterday of her outfit from last year's Met Gala. Celebrities and the who's who of the fashion world are arriving tonight at the Met Gala. And many are wearing hair accessories. 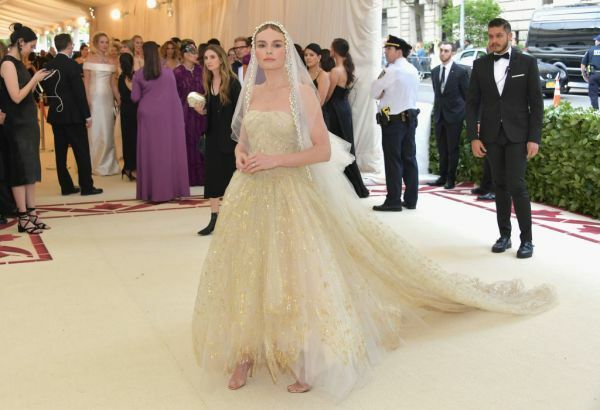 Tonight's theme for this year's Met Gala is "Heavenly Bodies: Fashion and the Catholic Imagination." And it appears Kim Kardashian is getting in the spirit. Kardashian shared this photo of her 8th grade self as a "Catholic school girl." Anna Wintour, Vogue's current editor, and her daughter, Bee Shaffer, walked the carpet at tonight's Met Gala. 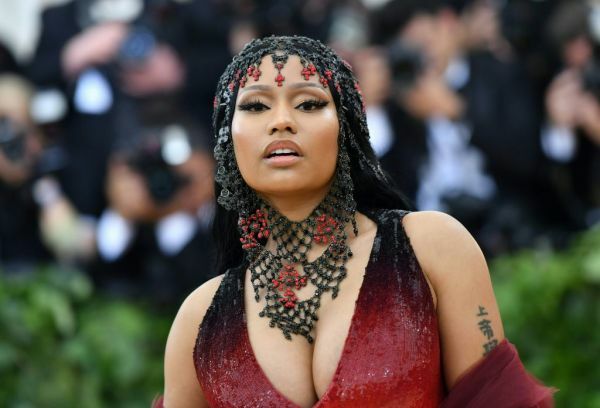 Wintour took over as chairwoman of the Met Gala in 1999, recruiting A-list honorary and co-chairs (including Beyoncé, Taylor Swift, Sarah Jessica Parker, and Tom Brady) and inviting everyone from Lil' Kim to Kim Kardashian to attract more attention to the event. Amal and George Clooney have arrived at the Met Gala. Amal Clooney, a prominent human rights lawyer, is co-hosting this year's event with Anna Wintour, Rihanna and fashion icon Donatella Versace. Amal wore a corset with a floral-printed train and fitted slacks, while George donned a classic tuxedo. President Trump likely won't be at this year's Met Gala — but he has attended at least eight times before. 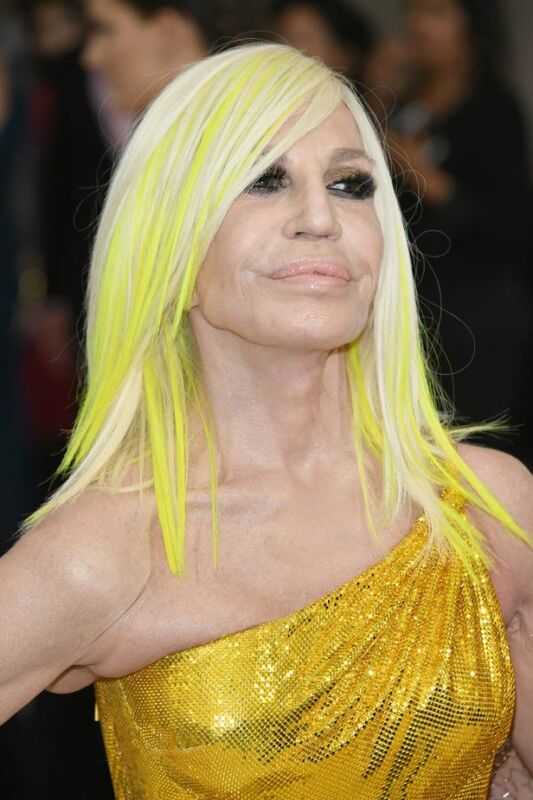 Fashion icon Donatella Versace, prominent human rights lawyer Amal Clooney and Grammy award winning artist Rihanna are co-hosting this year's Met Gala with Anna Wintour, Vogue reported. Celebrities took to social media to share photos of their prep work before tonight's big night. Guests will start arriving at New York's Metropolitan Museum of Art around 6:30 p.m. 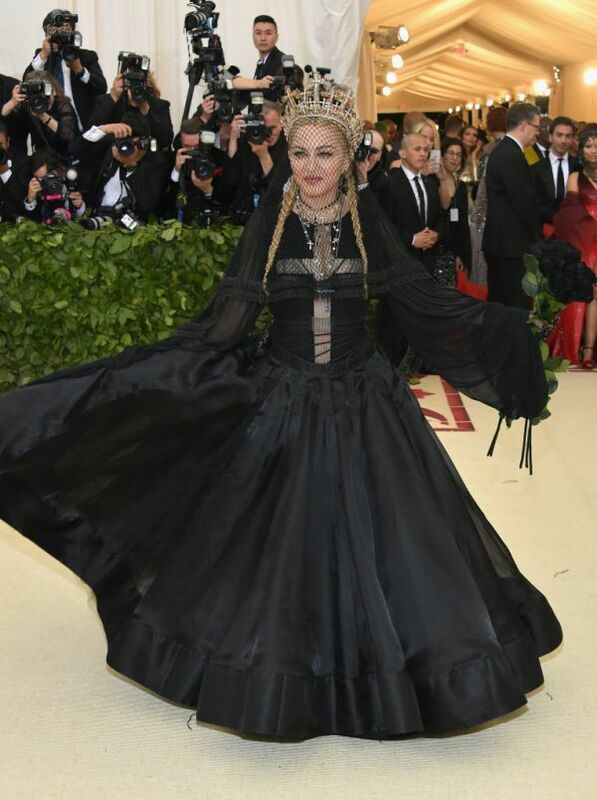 ET for this year's Met Gala. 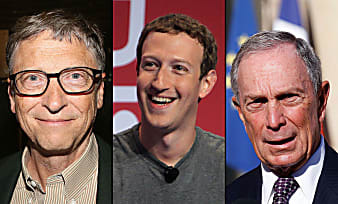 Our live coverage launches at 6 p.m. ET. New York's Metropolitan Museum of Art's Costume Institute is the only curatorial department at the Met that has to finance its own activities — so the gala is its biggest fundraiser. Former Vogue editor Diana Vreeland brought new glamor to the Costume Institute when she joined as a consultant in 1972. Vreeland curated some of the most ambitious and heavily publicized exhibitions in its history, and used the gala as an opportunity to inaugurate them. 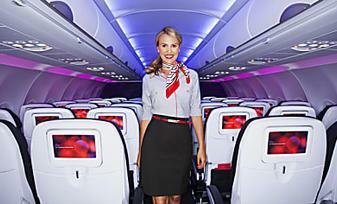 Her themes included "The Glory of Russian Costume" and "The World of Balenciaga." Anna Wintour, Vogue's current editor, shifted the focus to celebrities when she took over as chairwoman in 1999, recruiting A-list honorary and co-chairs (including Beyoncé, Taylor Swift, Sarah Jessica Parker, and Tom Brady) and inviting everyone from Lil' Kim to Kim Kardashian to attract more attention to the event.